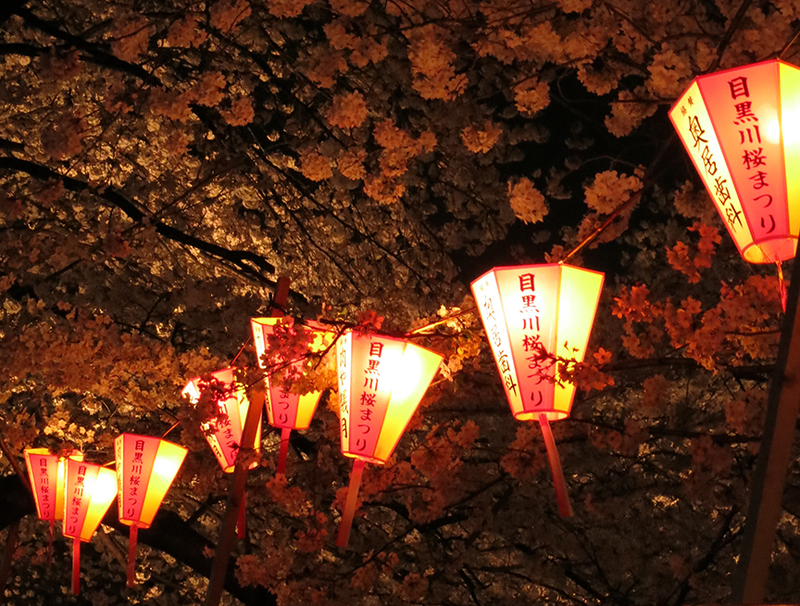 Home » Awesome Stuff To Do » Cherry Blossoms Lit Up At Night: My Favorite Spots! 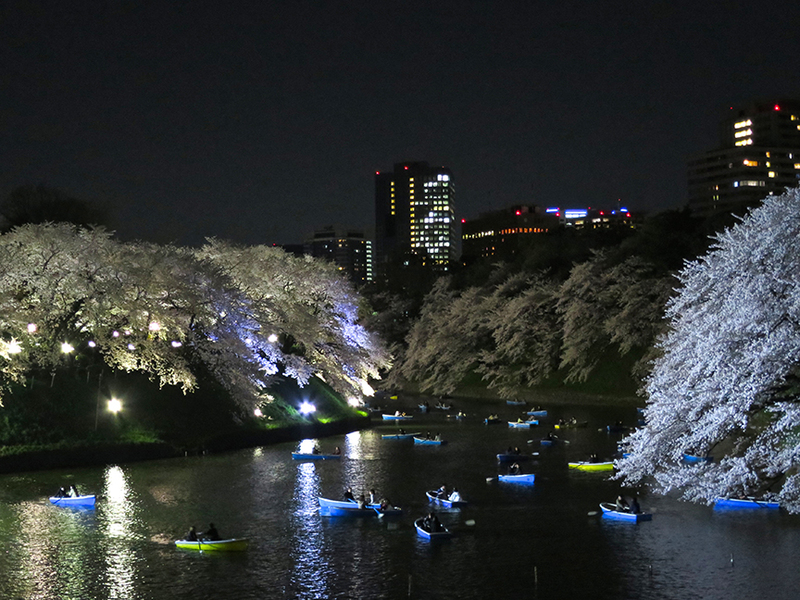 Cherry Blossoms Lit Up At Night: My Favorite Spots! 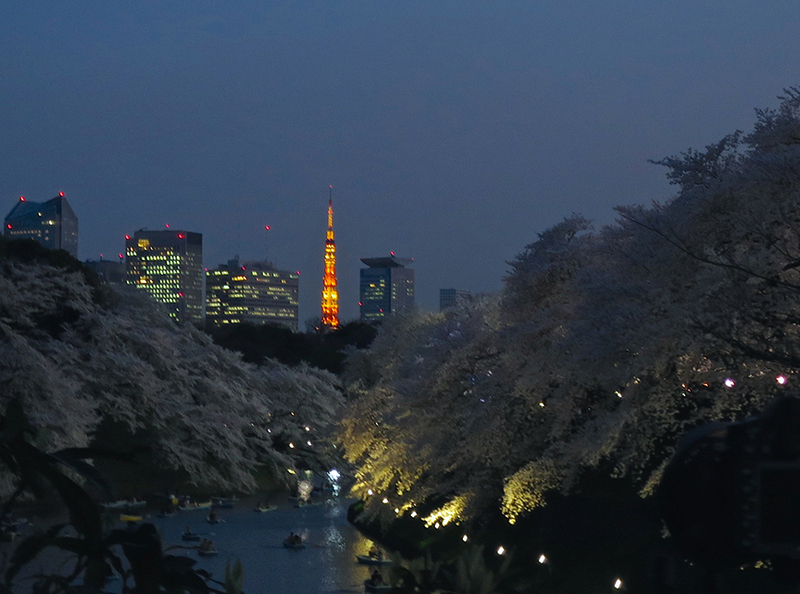 Oh no, don’t think you can put your feet up and flip some channels after the sun goes down during cherry blossom season – thanks to the current craze for “illuminations,” the ogling opportunities will seriously cut into your TV time. Here are my favorite nighttime viewing spots. Get thee to the nearest grove and give your camera a workout! At twilight, it’s especially great. Crowds are smaller too. 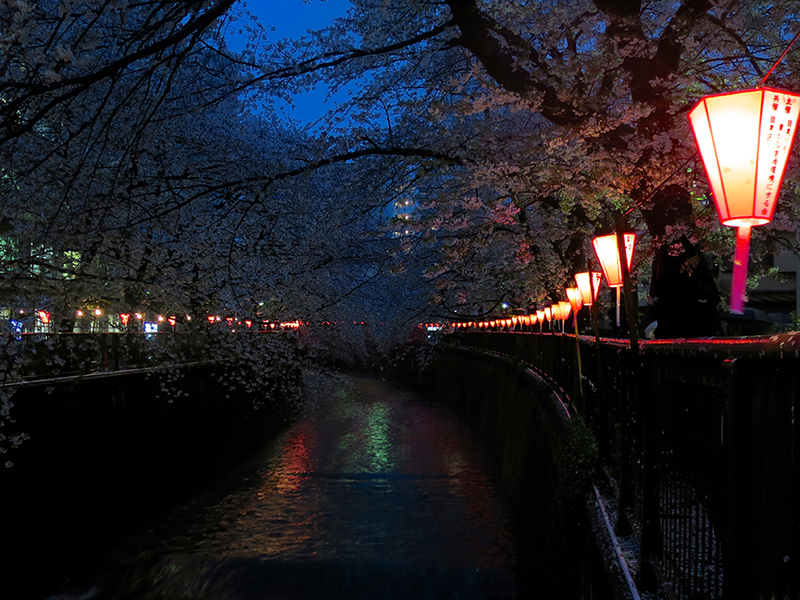 Lanterns are strung in the trees all along the Meguro River. This place is no longer undiscovered, but the upside of the crowds is that the paths are now lined with food stands and places to buy libations (beer, champagne, and champagne cocktails in glowing glasses). Nice of those people to stand in line for hours and pay a ton of money so we could take pictures of them on the moat. You can see Tokyo Tower from a spot at the Kudanshita end of the moat, if you can crane your neck past the giant scrum of photographers. For sheer blossom tonnage, nothing beats the Imperial Palace moat. Start at Kudanshita Station and follow it around the corner to the end where they rent the boats. If you absolutely must row around with the drunken mariners down below, plan to get in line hours before you hope to be down on the water. This tree never disappoints. It takes over your camera like some kid of poltergeist, and when you get home, you discover that somehow you have 612 shots of ONE TREE. The Famous Cherry, seen across the pond from The Famous Pine. 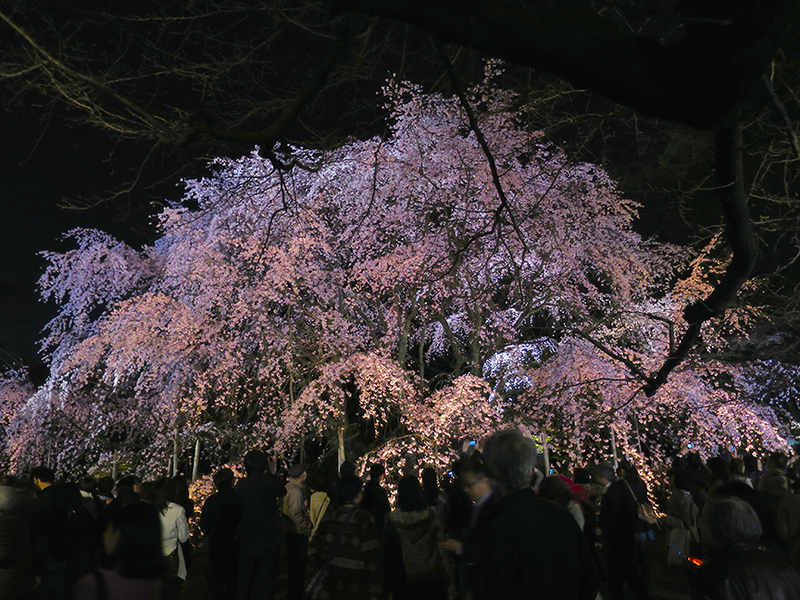 Rikugi-en Garden stays open until 9:00 p.m. for a week during cherry blossom season, so people can get their Famous Cherry Tree fix for the year. There aren’t a ton of cherry trees at this garden, but the the ones they have are pretty choice. 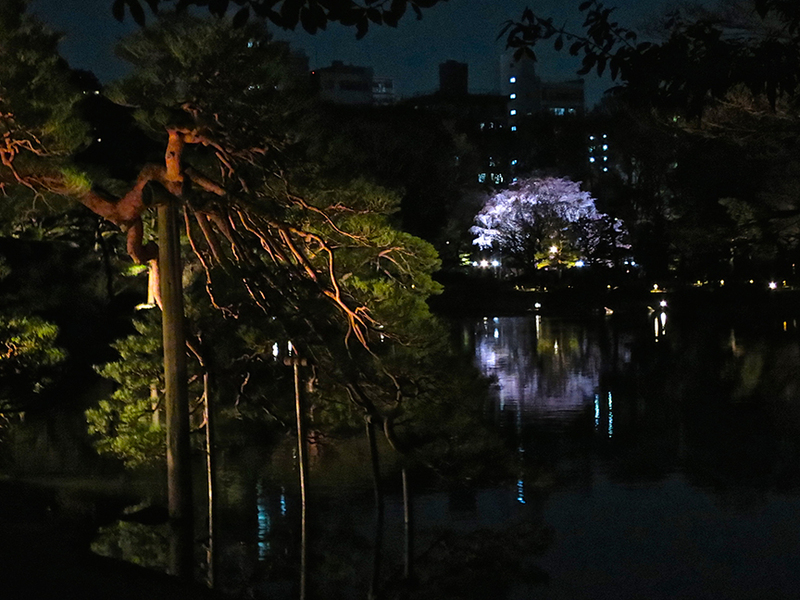 They light up the rest of the garden too, so you can stroll around and enjoy the shapely pines and Japanese maples. Oh, and lest I forget: even if you hate cherry trees, come for the miso dango. 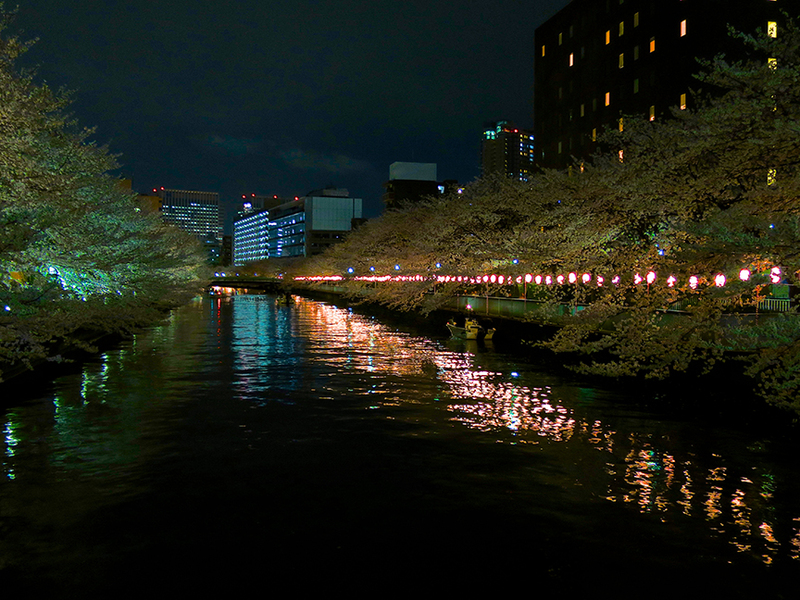 Lanterns line the path along the nicely narrow river near Monzen Nakacho station. Further along the river, cherry trees spill over both sides of the banks. Nobody ever goes to Monzen Nakacho. But they should. Check out how beautiful the riverside path is, all lit up with lanterns for the locals’ strolling pleasure! The lights are on from dusk to 9:00 p.m. and this obscure neighborhood is still undiscovered, so if you want to stroll far from the madding crowd and get something to eat at a nearby restaurant, this is the place to be. Okay, at the time I took this picture, I honestly didn’t register what it looked like, with those round pink trees at the base of the, er, tower. 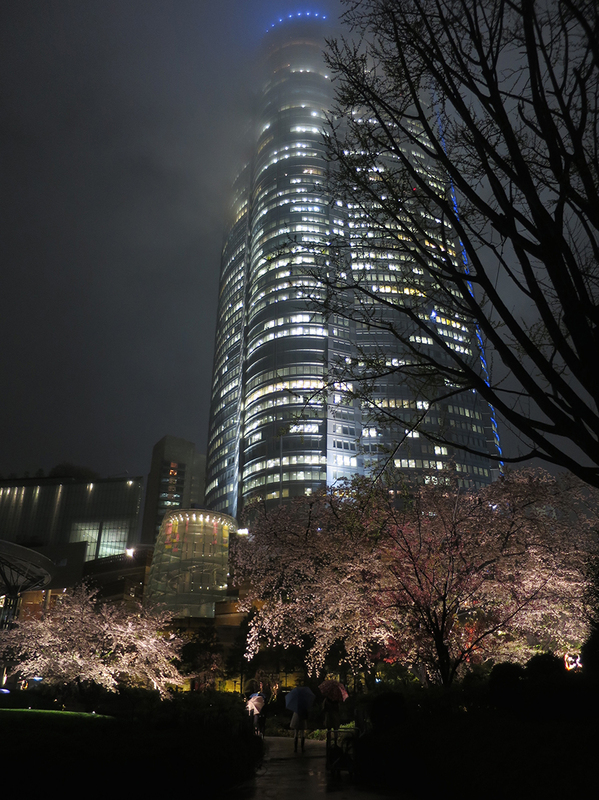 Roppongi Hills is mostly a boring shopping mall, but it does have a small garden that can be quite nice during cherry blossom season. Well-lit, it’s a pretty place to get away from the neon and concrete drunkenness of Roppongi proper. 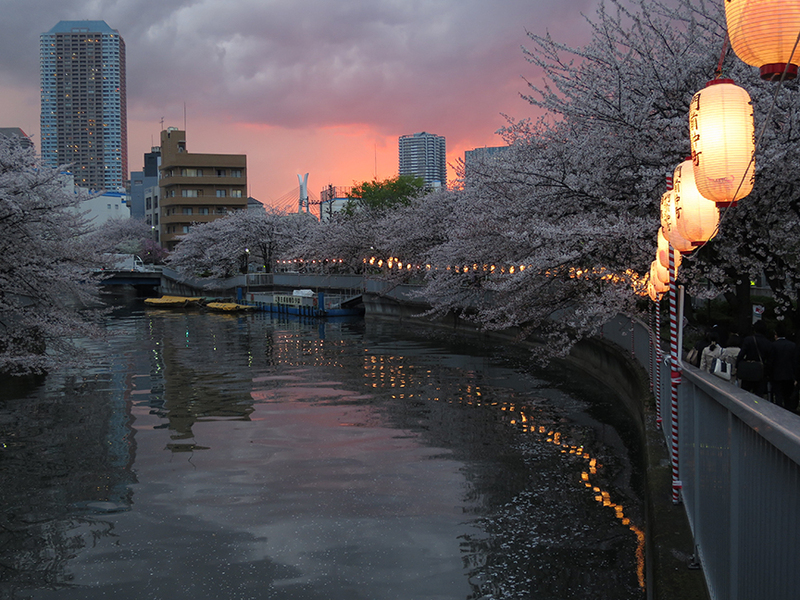 This town is just a twenty minute express train ride from Shinjuku Station, but the trees lining its little river are really worth seeing, plus it’s got a charming shopping street filled with traditional buildings that sell nice stuff. They just started lighting it up at night, so it’s still uncrowded and quite lovely, don’t you think?